Short answer: No, if . . .
It’s made in Hong Kong. It’s over-engineered to the point that it hampers function. Those who know me know I’m rarely seen not wearing a cotton khaki shirt. Long experience has shown the combination to be versatile wear for most of the places I frequent, from southern Arizona to southern Kenya. Fashionwise I should have been wiped out in the last mass extinction, but I like the look of a tucked-in business-like khaki shirt, and it lends a professional appearance that’s important for someone engaged in an outdoor profession. That same experience has convinced me that spending extra for a high-quality shirt pays off in the long run, in durability, fit, comfort—yes, even looks. At least, up to a point. I’ve written about the demise of the legendary outfitters Willis and Geiger (here). Recently Burt Avedon, the last respectable owner of W&G, created a new company with his longtime partner, Susan Colby. The first product the collaboration is the obviously W&G-inspired Signature Field Shirt, the link to which was sent me by a sartorially astute friend. Click—okay, great looking shirt. One hundred percent long-staple cotton Bush Poplin, check. Tea-died British tan, check. Zippered pockets behind the chest pockets, suitable for passport, check. Price? Oh. Ouch. Just when I’d gotten used to the idea of $100 Filson shirts. Still, I thought (okay, rationalized), while I’m certainly not rich enough to buy four or five of these things to abuse in the field, if it’s all that it’s advertised to be it would be nice to have one for, let’s call it ‘dress khaki functions’—lectures, classes, book signings and the like. Let’s check sizing, and . . . . sigh. I’m going to be diplomatic, because I do know a few genuine outdoorsmen who are just big guys (Andy, are you reading? ), but—when I see a size range in a shirt that begins with medium and goes to XXL (52-inch chest), I have to wonder if those products are really targeted at active, athletic travelers, or more at those who want to project the image of an active, athletic traveler despite the fact that they have attained a somewhat less-than-active physique. (I’m what I consider a rather ordinary 5’9” and 150 pounds, but my my shirt size these days is considered ‘small.’) To double-check, I looked at the ($134!) Avedon & Colby ‘British Army Officer’s Shorts.’ Sure enough, the smallest waist size was 34 (I’m a 31), the largest a 42. The A&C website shows a wartime photo of Field Marshal Montgomery and several officers in North Africa wearing identical shorts; despite what I bet were decent upper-rank rations, none of them looks to be anywhere near a 42 waist (check those knobby knees). First impressions were positive—it was indeed a good-looking shirt, with high-quality stitching and buttons. But, first major fail: It was made in Hong Kong. Frankly, at the price, this left me a bit stunned. There are shirts made in Hong Kong that I think are worth $180, but they’re from companies such as Ascot Chang and are are tailored to one’s exact measurements in ultra-premium fabrics. And . . . well, I tried it on and presented myself without prelude in front of my wife. Her first comment was, “Isn’t it too big?” And it was—my suspicions were entirely correct. The shoulder seams were good, and the cuffs hit the back of my hands; everything else was voluminously too large. I could have fit Monty in there with me (and yes, I know all about those rumors). The ‘retractable bi-swing back,’ ostensibly a feature to enhance freedom of movement, only made me feel like there was an extra quarter yard of fabric bunched up behind my arms, which indeed there was—it refused to ‘retract.’ The collar tab, designed to secure against drafts, instead flapped in my face when left loose. Had I kept this shirt I would have cut it off or sewn on a button to secure it folded away. Not all the features were superfluous. The zippered pockets would secure a passport and cash against street theft. The extended sun collar in back would prevent morning or afternoon sunburn. The bellows front pockets were actual bellows front pockets (listening, Filson?). The hidden button-down collar tabs prevent them flapping (which makes the loose flap all the more strange). The stitching details were all what one would rightfully expect. Obviously, given the sizing, I returned the Avedon & Colby shirt (an effortless and polite process). Would I have kept it had it fit? I don’t think so. I think the bulky and uncomfortable bi-swing back, the annoying collar tab, and the steep price-vs.-origin would have outweighed the quality fabric and construction and the functional features. Just to reassure myself, I put on one of my old Willis and Geiger bush shirts (sans bi-swing back), and shouldered one of our side-by-side shotguns. I felt utterly no restriction of movement despite the much slimmer fit. I can’t help thinking the bi-swing back is a solution to a problem that does not exist—unless, perhaps, you’re of considerably larger girth than I . . . While the Signature Field Shirt was not what I’d hoped, I’m still happy to see Burt Avedon and Susan Colby producing high-quality field wear. I hope their line expands with more products and more sizes—and perhaps some production brought back from overseas. Okay—commence scurrilous emails . . .
Filson redux . . . Early this year I posted an article titled “Et tu, Filson?” which detailed my concerns that Filson—long one of the most reliable suppliers of high-quality expedition gear and clothing—might be headed down the same diluted and fashionized path as so many other historic outfitters (read it here). The article produced a flurry of comments, and a surprise: a lengthy and obviously sincere interaction with a Filson customer service representative named Phil, who promised he was passing the dialogue along to marketing executives at the company, and who assured me there were many long-time employees who shared my concerns and were determined to keep serving Filson’s core customers. My specific rant concerned Filson’s Feathercloth Shirt, which had long been my standard wear for both the Arizona desert and Africa. From a pricey but bearable $70 it morphed overnight into something called the Seattle Shirt—same item, only double the price, which made it untenable (for me, any way) as a working shirt subject to hard use and possible tears. I rued its loss, and wished aloud (and loudly) that Filson would designate some Feathercloth rendition as a real outdoor shirt, and drop the price. And . . . voilá. Last week I got an email from a fellow shirt wonk, Gary Haynes: “Have you seen this?” Included was a link, which, when opened, introduced me to the brand new Filson Expedition Shirt. Feathercloth, some interesting-looking features, and a sub-$100 price—right on the edge of finger-curling affordability (only given the astonishing lifespan of my earlier Feathercloth shirts). Wow, like, Power to the People. I called the long-time Filson public relations rep Amy Terai (a veteran in an industry that usually chews through personnel like gum), and asked for a sample. So, let’s take a look at this thing. So, on to other features. There are two large breast pockets, properly flapped and secured with buttons—which, unlike Velcro, will work just as well in three years as they do now. New to the Expedition Shirt are buttoned tabs for rolling up and securing the sleeves above one’s elbows—nice—and four gusseted vent holes under each arm—even nicer. The fabric under each forearm is doubled for abrasion resistance. The collar does not button down. I prefer button-down collars to keep them from flapping in the wind and to keep the shirt looking neater, but that’s a small gripe; I often simply sew on such buttons on myself. Speaking of buttons, they seem a bit more substantial than those on my earlier shirts. On the other hand, the shirt’s seam stitching has opened up a bit, from ten per inch to nine. I’ve never had a seam blow out on a Filson shirt so I’m not sure this matters, but I wonder how much they save by turning a dial on the sewing machine. What distinguishes the Expedition Shirt in catalog photos are the epaulets. Epaulets—something of a misnomer, as an epaulet is properly the military shoulder decoration that was held on by what we now call the epaulet—are useful at times for securing camera or binocular straps when you don’t want them sliding off your shoulder. To work effectively, though, they must be sewn through about an inch inward from the shoulder seam, otherwise the strap of whatever it is you’re securing can drag the shirt off your shoulder. A proper epaulet . . . The Filson’s epaulets, I noted, are properly sewn through, so I lifted the collar to check the securing buttons and . . . um . . . huh? There are no securing buttons. The “epaulet” is sewn on at both ends, rendering it nothing but a fashion item. Okay, so that’s a fail. On virtually every other count, however, the Expedition Shirt is not only a welcome new product, but an actual upgrade to the original Feathercloth Shirt, which helps make up for the price difference. Finally, it’s available in “small,” which fits me properly. I use quotation marks around “small” because I’m five nine and 150 pounds and used to be considered a solid medium. Now “medium”—which is the smallest size a great many companies offer any more—is tailored . . . no, wrong word! . . . constructed for 180-pound guys, and at the other end of the scale they just keep adding X after X to the L. If the world were fair I’d be able to buy two small shirts for the same price as an XXXXL since they probably take the same amount of fabric. And while we’re at it, the person next to me on an airline should have to pay for half my seat if he oozes over into my space. And furthermore . . .
Ah. Where was I? Oh, right: While I’m still trepidatious regarding the eventual fate of Filson, given the current ownership and the whole “lifestyle” movement (not to mention the tragic decline in so many field sports), it does seem that, indeed, there are people at Filson who want to continue the Filson tradition and serve the company’s core customers—people who actually spend time outdoors. Bravo. When I stay local and practice slow (under 15 mph) motorcycle exercises on the weekends, I wear a Leatt Coolit vest under Klim’s solstice base layer (the high neck hides the vest), and then modular protective gear on top of that. The cut of the vest is made for a man, but does fit the curves of a woman well and true to size. All the cooling vest needs is a quick 5 min soak in the sink, a good squeeze to remove the excess water and it’s ready to wear. 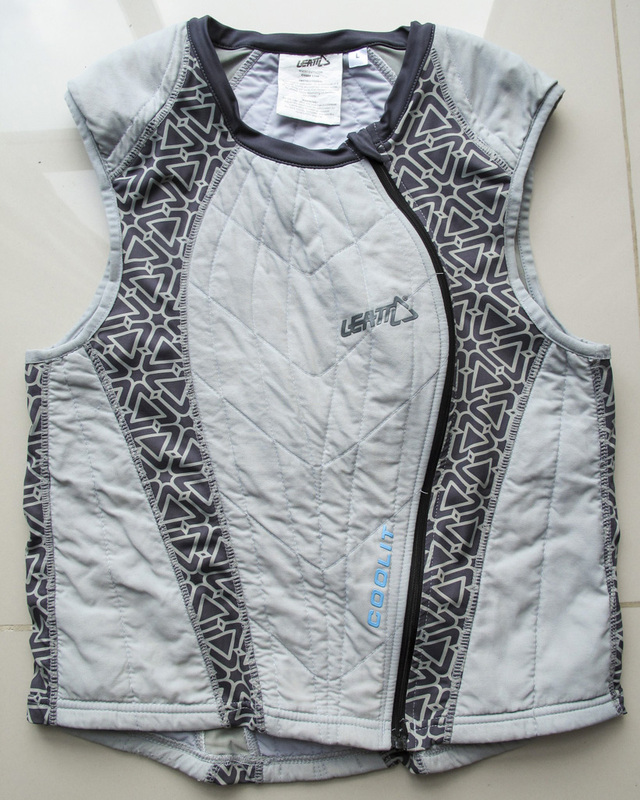 The vest retains water for a few hours, depending on heat, body heat, and humidity. Where I live, on average, is 80% humidity and the “coolness” lasts for about 2-3 hours during hot 90F weather. After about two hours, the vest is still damp, but has warmed up to my body temperature and lost its cooling effect. I keep cold water with me and will drench the vest again (while wearing it), but most of the time a fast lap or two around the block helps. > Read full article here.